Every summer, thousands of top college graduates pack their bags and head to Wall Street to start new lives as investment bankers and traders. Even after massive economic collapse, a career in the financial industry remains a tempting path for many of America's best and brightest. But what happens to these financiers-in-the-making once they get down to business? YOUNG MONEY is an unprecedented (and unauthorised) trip inside the well-guarded subculture of the young investment bankers and traders who have come to work on Wall Street since the financial crisis of 2008. 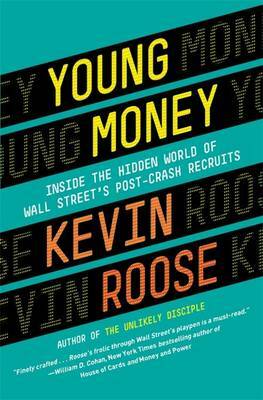 Author Kevin Roose spent more than three years shadowing eight first and second-year workers at Goldman Sachs, Bank of America, Merrill Lynch and other leading investment firms. Through hundreds of interviews and mountains of original reporting, Roose became a fly-on-the-wall for the college recruiting sessions, pre-hire training programs, 100-hour workweeks, big bonuses, and wild parties that characterise the young Wall Street experience. But he also saw the self-doubt and soul-searching that seeped into the financial industry after the crisis, and the psychological effects that the industry's struggles had on twenty-somethings whose careers were just getting started. YOUNG MONEY is more than just a sordid cultural expose filled with 'models and bottles' excess; it is also an accessible look at the financial world's bottom rung, and the story of how the economic collapse changed a genreation's attitude toward money and success. In the same way that Scott Turow painted a vivid portrait of first-year Harvard Law students in One L, YOUNG MONEY reveals the undiluted voices of the young people on the front lines who are poised to rebuild Wall Street from the ground up.